Love a clean kitchen? A clean kitchen can be a total mood changer. Of course having a clean kitchen ALL of the time can seem unrealistic but I’m going to share with you today how to have a clean kitchen 99% of the time. I’m not one of those clean fanatic type people but maintaining some degree of clean at all times is crucial to finding peace in my home. I think this is true for most people. Nothing more frustrating than dirty dishes when it’s time to eat again. Let me back up to how this all began. Back in January I was tired of finding rust spots on my utensils. A google search found that it could be from leaving food residue and water sitting on the dishes in the dishwasher too long before washing. The habit, I’m sure many of us have, of filling the dishwasher a few items at a time until it’s totally full. Seemed like the most efficient way to me. After all, the kitchen did “feel” clean when the dishwasher was loaded. I was like, ok, I’ll hand wash all of the utensils in order to keep them from rusting. That was on a Saturday. By Sunday I decided that if I was going to wash all of the utensils, I might as well hand wash all the dishes that day. That was 4 months ago. In that time I have ran my dishwasher approximately 6 or 7 times. SERIOUSLY, that’s true! Unloading the dishwasher seemed like such a chore. I don’t know why but I have a love hate relationship with the dishwasher. Once I started hand washing the dishes I loved how clean the kitchen stays. The dishwasher was a way for me to procrastinate doing a chore I didn’t love. Realizing my own procrastination was huge! It gave me a new mindset about my kitchen. I am not opposed to using the dishwasher at all but very limited. The times I used it was when we had guest over and I was able to fill it and run it right way. I also made myself not procrastinate unloading it. No more wondering are the dishes clean in the dishwasher. There is always a clean spoon when you need it. Intentional reuse of cups during the day. Everyone helped more with dishes. Don’t leave home with any dishes in the sink. Wash the dishes as you cook. Give yourself grace. If you have half of a load for the dishwasher and you’re tired or overwhelmed just run it half full. Clean sink is like making the bed, makes the rest of the room look cleaner. Also, in an effort to use less chemicals in my home I started using Seventh Generation dishwashing liquid and I am very pleased with how well it cleans. I hope this helps you in any way. Give it a try and let me know if you have the same results. This is what I’m wanting to do, but I thought I must be crazy! 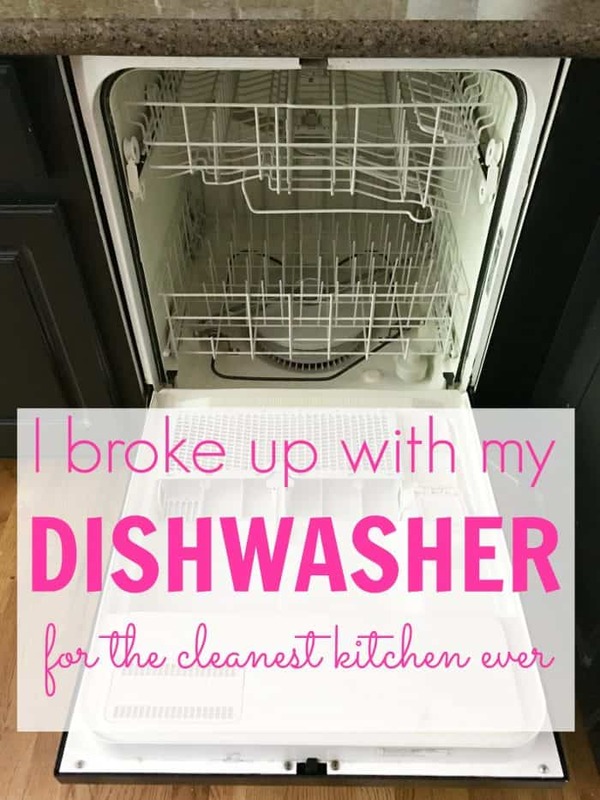 No one gets rid of their dishwasher! I am thrilled to know I’m not alone. It has seriously made such a difference in keeping my kitchen clean. I still have my dishwasher but it’s use has seen a rapid decline. I’d love to hear back after you give this a try. YES, sounds like the dishwasher is a must for your family. Our dishwasher broke over a month ago and we haven’t gotten around to replacing it. I love the fact that everyone in our house is more conscientious with the amount of dishes being used so that they don’t have to wash them! We seem to have less dishes to wash now. We wash them after each meal and put them away as soon as they are dry. We always rinsed the dishes well before putting them in the dishwasher so it hasn’t felt like much more of a step just to wash them by hand with soap! All four kids help so that makes a difference. I love not having to unload the dishwasher! YES!! This is all so true. My brother and his wife have never had a dishwasher.I use mine when I have a full sink and can start it right away. Otherwise we hand wash.
We’ve just moved to a house with a dishwasher after four years without one, and we’ve decided the same thing. Still handwashing, used the dishwasher twice in a month when we first moved in, then when we had friends over. Seems so inefficient after hand washing for so long! !